Heat up your hookah session with quick lighting hookah charcoal. Easier to use than regular coals, quick lighting hookah charcoal can be quickly lit using a torch lighter or direct heating source. 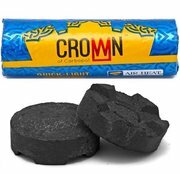 These coals are odorless, tasteless, and do not interfere with the quality of the smoke. 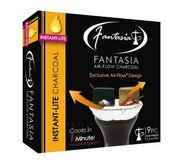 Top quick lighting hookah charcoal brands to make smoking hookah easier than ever! Available in 33 and 40mm single rolls and boxes. 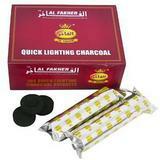 Why Use Quick Lighting Hookah Charcoal? They are convenient. Quick light coals can be heated up with nothing more than your lighter. You can apply heat more effectively with a torch lighter, but whatever your method these coals are designed to add convenience to every hookah smoke session. 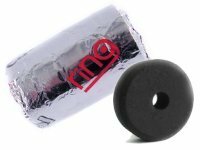 They are cost-efficient.Want more from your hookah coals? You can get 60 to 90 minute sessions for only a few coals. Quick light coals let you maximize your hookah time and can even save you money in the long run. Every hookah lover has their favorite brands. Choosing hookah coals is no different. 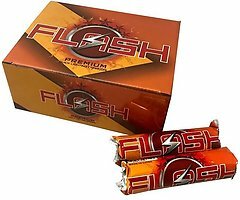 Although each offers you the advantage of starting your hookah sessions more quickly, different brands of coals let you choose the one you prefer most. Miraculum is one of the most popular quick light hookah coals. Made in Holland, Miraculum uses a unique formula that offers a consistent burn for better heat. Available in single roll or ten roll boxes. 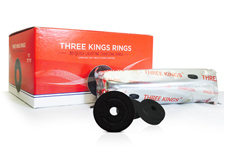 Three Kings is widely considered to be the original quick lighting brand, so you know you can rely on them for a quality smoke. 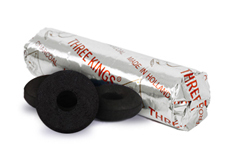 No odor or charcoal taste with Three Kings coal just delicious hookah flavor. You can also find top brands like Starbuzz, Al-Fakher, and Fantasia. All these brands have joined the quick light coal market to offer smokers a reliable name they can trust. If you are traveling or looking for the ideal coals for your hookah lounge, or even if you just want a faster way to smoke, hookah quick light coals are a great choice. Order yours now or contact us at 888-577-6653 so we can help you find the best product for you!